Rapture World Conquest is free to download here and on Android here. In May we updated our title Rapture – World Conquest making it Free to Play (F2P) on the App Store – adding static ads, rewarded video and tightening up our in-app purchases. It was a bit of a leap for us, but necessary after 7 months of mediocre premium sales. So five months on we thought we’d give a few details of how the transition has been, with some stats and overall whether the revenue has improved. For those of you who haven’t read the original article it’s here. But to summarise our journey so far; Andy and I set up Tundra Games in 2013 to make our dream indie game. 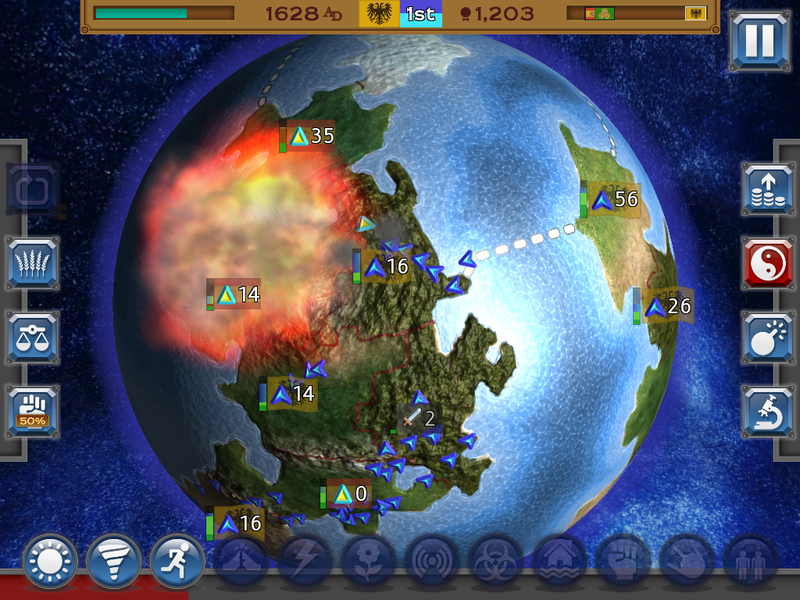 The game which finally arrived on the Apple App store shelves in September 2014 was Rapture – World Conquest – a lightning fast version of Sid Meier’s Civilization. A bit of an homage to the great game and also a way of getting a flavour of the gameplay in as small a time frame as possible. Press reviews were good – TouchArcade and Pocket Gamer. And initial sales were great, especially with the feature we received from Apple in the first few weeks. However sales quickly died down as did our initial wide-eyed dreams of indie mega-stardom. Then began the long slog of trying to get people interested in our little title. After 8 months of disappointing downloads and shouting into the indie game void, we decided to try our hand at the F2P market. There were countless articles about it and we thought we had little to lose. We also saw it as a useful exercise to see what worked – so potentially we could go a similar route with future games. With the original game, we had already laid a lot of the groundwork for F2P. In-App Purchases were added fairly early on – we decided to include coin packs and a coin doubler in the game. As mentioned in the previous article, this decision turned out to hurt us. We were careful to ensure that the coin packs were never a necessary part of the game – most of the unlockable elements in the game are decorative only and meant as a way of encouraging players to earn gold and customise the game. However the game was released around the time where players were pushing against premium games having purchasable items for real world money and many of the negative reviews focused on Rapture being a paid game, but still attempting to twist money of players. In subsequent updates we pushed the IAPs further into the background – less in the face of the paid players. When we went free, we brought them back to the front a little more. We changed our coin doubler IAP to a “VIP pack”, which not only included the doubler, but also removed the ads from the game and gave a chunk of in game gold as a thank you. We hoped that the purchase of the VIP pack would be a no brainer for players -that they would see it as a bargain and as a way of supporting us, the developers. We added static ads that pop up a full screen advert after each game. We saw these as the main reminder (irritant) to players that they were playing the free version and it would encourage them to (possibly, perhaps, please, thank-you) buy the VIP Pack. We also hoped that even if they didn’t pay any money, that we would still have a minimum amount of revenue from these ads. We used AdMob (from Google) as the main provider of ads. Other developers had recommended it and AdMob has decent mediation support – where you can plug in a number of other ad-providers which will be served through the AdMob network. These ad-networks can be controlled from the AdMob online dashboard, you are able to switch them on and off and also control their weighing (how much the system will favour showing ads from a particular network). We felt this would give a lot more flexibility and would be less work than implementing providers separately and doing the mediation ourselves. We also added Rewarded Videos – where players are rewarded with in-game gold for watching ad videos. 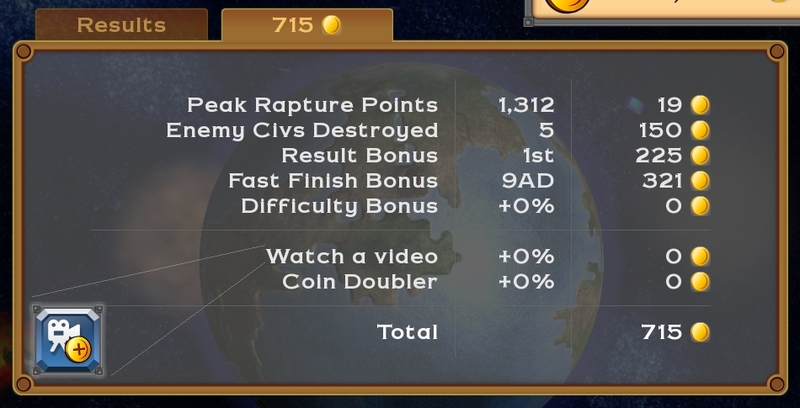 After each Rapture session the player could watch a video and the gold from that game would be multiplied by 50%. We decided to make the videos fairly passive – available as a button on the results page that was available if the user decided they wanted to use it, but not too aggressively forced upon them. A video watch option was also added to the main IAP shop. Players can go into the shop and get 100 coins directly by watching a video. Again a fairly passive system that was there for players to use if they wished. We decided early that the F2P changes should not impact our current players – those that had already purchased the game. The plan was to make our current title free, rather than create a separate free game on the app store. So we spent a lot of time writing code to detect the version the player was using. Upon updating their game, premium players were automatically rewarded with the VIP pack – so they would never see the ads and would also receive the doubler and extra gold as a sort of thank you. The code detected the version number by querying the app store. There are a few known issues using this method and we foresaw other potential problems. To pre-empt this we added a reimbursement system, so if anyone complained, we could give them the VIP pack or in game gold by querying their device ID and adding it to a file hosted on our own server. The game was updated to F2P in May. We received reasonable coverage and the initial downloads were very good. On the first 4 days we had 21,705 downloads. Most of the coverage seemed to come from being noticed by “free-app-a-day” websites. The transition to free went well, we only had a few problems with people updating, and usually it was due to old iOS versions. The peak is almost 12K downloads. We reached #61 in the US iPad charts. Less than we hoped, but still reasonable for the free charts. After the first few weeks our chart positions fell quite fast as did the downloads. Here’s the downloads from May up to now. In all we’ve had 47K new downloads in the 20 weeks since going free, compared to almost 11K in months before. Since the initial burst of free downloads the numbers have hovered around 100 to 150 per day. We made $1,191 in premium sales for Jan-May with the price set at $2.99 – around 1-5 sales a day. Fairly poor compared to our first few weeks, when we peaked at 1,147 downloads in one day. (The peak in this graph is the release of multiplayer update, by the way). $171 in all – $41 from IAPs and $130 from Ad revenue. And here’s the full revenue from May till now. Generally we’re hitting about $5 to $10 per day. $1301 in total – $183 from IAPs and $1118 from Ad revenue. So how does this break down? Initially we played around with the mediation settings – changing the weighting of which ad-network to use. We had added several networks – Leadbolt, iAd (Apple’s network), Flurry, Facebook, Millennial Media and InMobi and we played around with different weights. However ultimately AdMob seemed to generate the most revenue by far and changing weighting seemed to negatively affect this revenue (perhaps we were being punished by Admob for fiddling with weighting) In the end we left AdMob to handle the weightings and turned off some of the less profitable networks. Nearly all the revenue above is from AdMob. We implemented two video ad-networks – Chartboost and AdColony. We did the mediation ourselves – the code shows videos alternatively between the two networks. Chartboost has generated by far the largest revenue. But generally players have not been watching videos to boost their in game gold and very few have been going into the IAP shop to watch videos for gold. To be honest, we were quite surprised by this, it feels like easy money after a game to multiply your gold. As mentioned, the inclusion of in-app purchases in our paid game met quite negative responses from players. However the revenue from IAPs during our paid time was reasonable. We made $1392 before going free. Perhaps not worth the negativity, but still a reasonable amount. Of those 75 sales, 57 were VIP packs and 18 were coin packs. Someone actually bought the most expensive pack at $19.99 (the big peak at the end of July). If you’re out there, we appreciate your support! So although paid players have complained about IAPs, they actually seem more likely to actually buy IAPs. It’s as though those players who actually paid for the game are already a self selected group of people who actually spend money, plus they’re going to be a much more engaged audience because firstly they think that games like ours are worth money, and second, they’re likely to invest a decent amount of time in the game because of the sunk cost they’ve already put in. It suggests that, no, in terms of revenue we’re not making as much. However revenue is not the whole picture. Now we have a F2P model, there’s a lot more with can try in terms of changes the game to try and get people to buy IAPs and watch ads. Our new Android version and update to iOS will have a number of tweaks which we hope will improve the situation. I’ll save the details for the next blog post – when we have some data on whether the changes have helped. We’ve also released a separate paid version of the iOS game (here). This is a stripped down version – no IAPs, no ads, just the pure, unadulterated game. We’re hoping it will appeal to gamers that might be put off with IAPs. And will let us compare against the free version and possibly market it differently. Again, we’ll come back and let you know how it did. One additional area we were hoping to improve on was our chart position. We were hoping that the additional downloads would push us up the charts and get us further exposure. Generally we’re now slightly further up the charts, but if you’re not in the top 100, it doesn’t seem to help in terms of exposure. Here’s our chart position on the US iPad Strategy chart. Apart from the initial release where we peaked at #8 (oh happy days), we haven’t managed to get back up above 100. During our time as paid, we would bounce up and down. Since going free, you can see our position has stabilised, but still fairly low. During our paid time we received a fairly mixed bag of reviews, people either loved or hated the game. Most of the negative comments were due to the IAPs and a few criticised the speed. Since going free, we have had more reviews (obviously due to more people playing). And generally they have been better. If I’m honest personally the negative reviews were hard to take, especially after spending so long on the game. So receiving some new 5* reviews has helped reenergise my thirst for indie dev. It’s not all about money – actually knowing that 4 times as many people are playing and enjoying the game is immensely satisfying. This week we have released the new Android version of the game. The Android version has a similar monetization strategy to the iOS version, with a number of tweaks. We’ve also made these changes in the iOS version. We’re hoping the free version of the game will be a great fit with Android. If you fancy taking a look, please download the game from here for Android and here for iOS. Once the dust has settled on Rapture we’re going to take a step back and consider what’s next. Having spent 3 years on a single game, it’s time to look to something new. We have a number of ideas for titles that have been thrown around, so watch this space for announcements in the coming months. Please download Rapture and take a look. We appreciate feedback – even if it’s criticism. It’s the only way we can understand what players and fellow devs are thinking and where we might be missing the target. We’d also appreciate reviews on the app stores, as it really helps downloads. Daniel Collier is the co-founder and managing director of Tundra Games. Tundra Games is an independent game studio based in Oxford & Colchester UK. It was founded in November 2013 by industry veterans Andrew Weinkove and Daniel Collier. We have worked on many AAA titles including Skate It, Sims 3, FIFA, Madden, Angry Birds Star Wars, Angry Birds Go and Need for Speed. We have worked for companies such as Exient, First Touch Games and Rebellion. Please contact Dan for further details at dan.c@tundragames.com. Our game trailer can be found here: with further details and screenshots via our website – www.tundragames.com. Play the game for free on iOS here and on Android here. Hi there, thank you very much for publishing all of this information. We are at the point where we have to decide whether to go F2P or not, how to go about doing it, and it seems you have the same outlook on how much to squeeze your players into paying. Anyhow, very insightful, I learned a lot! Are you planning on launching on PC?